Map pin strokeMadridgroup visibilityGrupo público0 conversaciones Eres el administrador del grupo close1 miembroHello!! Are you thinking about learning or improving your Spanish? 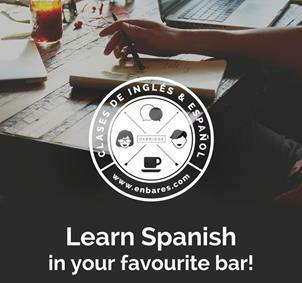 Enbares.com is an initiative launched by Oxbridge,through activities you will see vocabulary and structures which are necessary to speak Spanish anytime anywhere. We would like to invite you to one our classes, you will see how your Spanish skills will improve. Visit our website, choose your favorite bar and your level, and sign up, we will contact you shortly in order to schedule your class in your favourite bar!The first class is for free! Hope to see you in your favourite bar!